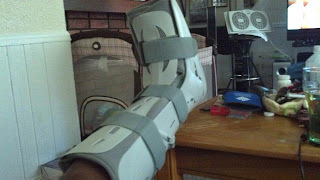 So yes I am in a boot and crutches. 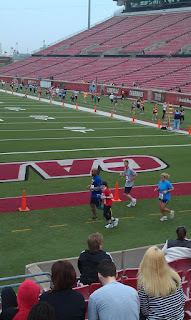 While running the Kentucky Derby Festival Marathon this past April, somewhere around Mile 18, I knew I had hurt my foot. I made a strong mental note because I knew at some point my doctor would ask when I did it. It was nothing serious, but as a Runner or and Athlete, you know your body very well, and I knew this would plague me later. Well, this race was the last leg on the Louisville Triple Crown of Running, so I wanted to see if I could extend my trend of PR-ing and PB-ing. Also, like the Anthem 5k and the Rodes 10K, this race, the Papa John’s 10 Miler, would occur right after me working a 12 hour overnight shift and later on working another 12 hour shift. So as I went to bed Thursday night, I realized that I wouldn’t sleep again Monday, and that meant this was my last bit of sleep until the race 2 days later. 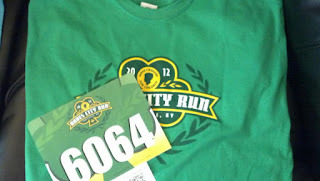 Friday, the day before, had me going non-stop, including Race Packet Pickup. So all of a sudden, it was time for me to head into work. Which was hectic, but suddenly it was time to get home and change into my Race Gear and head out. 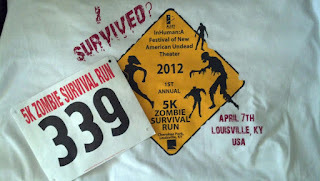 Well, this was another race, coming straight after working a 12 hour shift. So the first thing I noticed was that the weather was going to be OUTSTANDING! It was around 60 degrees with a slight cooler wind, which as a runner, means your body temp will basically be regulated by Mother Nature. This was also going to be a first in my Running Career: Damary and the Girls would not be there to see me off, or cheer for me at the Finish Line. So on top of being tired from a UNUSUALLY busy night at work, I was shook from being so completely out of my normal pre-race routine of hugs and kisses from the people that mean the most. 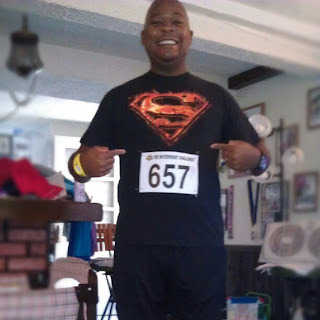 So here I am, a year removed from running my first Triple Crown..Lining up at the Starting Line to run my second Louisville Triple Crown of Running, starting with the Anthem 5K. 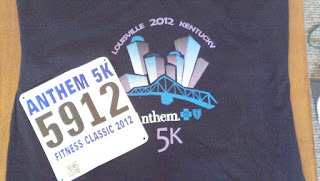 Last year's Anthem 5K still remains my best 5K time (32:37), both my Personal Record (P.R.) and Personal Best (P.B.). 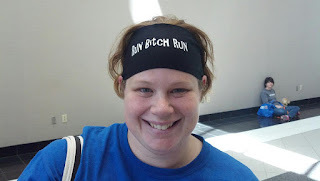 I had a couple of things going on in my head...one of them is that this time around, as I close in on my 2nd Anniversary as a Runner, I work 3rd shift, and have a newborn. My training 95% of the time occurs on no sleep, with another 3% occurring with little sleep. The other thing that was prominent on my mind is that all three Triple Crown Races will occur with me coming straight off a 12 hour shift, so no sleep.